Beginning with version 2.0, the program allows reading cached domain records. Windows uses cached domain records to be able to connect to the server even if the logon server is unavailable for whatsoever reason. The plugin for handling cached domain records includes three steps. In the beginning, decide, which records are to be decrypted: cached records of the current operating system or of some other computer. 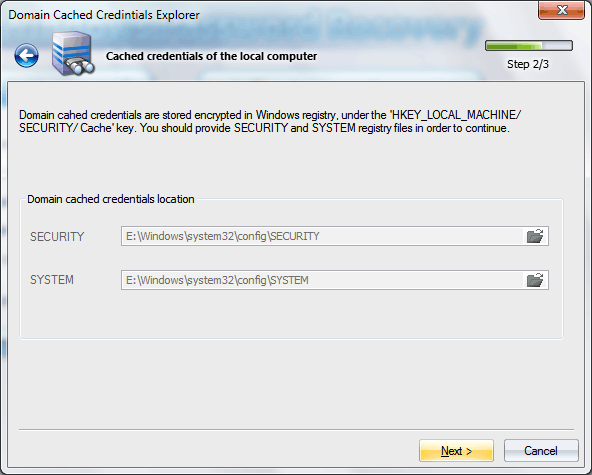 Cached domain records are stored in the SECURITY registry file. Thus, when selecting the option to read records from an external PC, on the next step of the Wizard, you should specify the path to both SECURITY and SYSTEM registry used for decrypting the records. When selecting the option to read cached records of the local computer, on the second step of the wizard, the program will automatically locate those files. The registry files are located at the following folder C:\%WINDIR%\system32\config\, where %WINDIR% is the Windows directory. If the reading was successful, in the final dialog you will see the decrypted domain records. Each record has several attributes. For example, username, last logon time, group membership, cached user password (actually, hash). Save records with all attributes to a text file. Export password hashes to a PWDUMP, *.DCC or *.PEIF file. Please note that the PWDUMP format stores records not quite properly; therefore, it is more preferable to save domain password hashes to *.DCC or *.PEIF file. 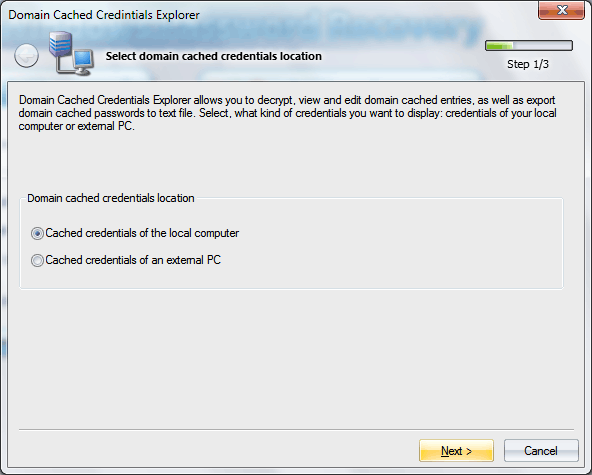 Check or reset the password for a cached domain record. 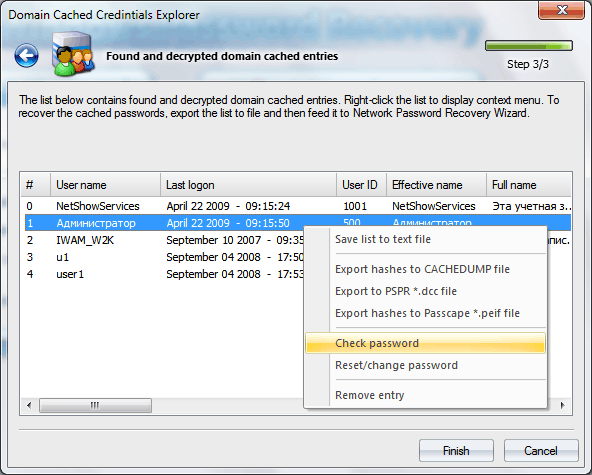 To recover cached domain password, you can take advantage of Network Password Recovery Wizard; just have the hashes exported to a file of one of the above-mentioned formats beforehand.